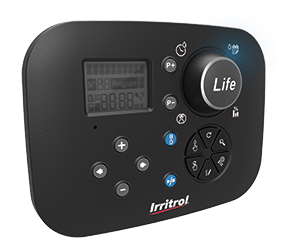 Irritrol is proud to present LIFETM: give «life» to your garden and enjoy «life»! 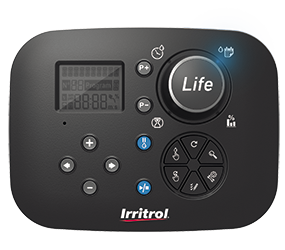 Thanks to Irritrol you could dedicate more time to the people you love: from today LIFETM will take care of your garden! Installation and future servicing are quick and simple with a large LCD display and intuitive interface. The multilingual display can be set to one of 5 languages: English, Spanish, French, German or Italian. Irritrol has conceived a product with an elegant and avant-garde design: thanks to its colors and its look & feel, the new controller have many useful features and become as well a piece of furniture for your home. The optional Wi-Fi module enables the controller to be remotely monitored and accessed anywhere within range of your home wireless network device, and can be remotely controlled with a smartphone. The Water Budget feature enables the run time of all stations assigned to a specific program to be increased from 0% to 200% in 10% increments. With the Rain Delay feature you can postpone automatic watering operation from 1 to 31 days, with a consequent saving on water consumption. 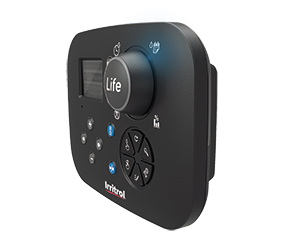 LIFETM is the only controller on the market with a modular option: this means that only 1 control unit can be purchased and used for the various versions (Basic / Plus) and for different irrigation systems (indoor and outdoor). 2 independent programs and 3 start times that can run concurrently with start time overlap protection within each program.